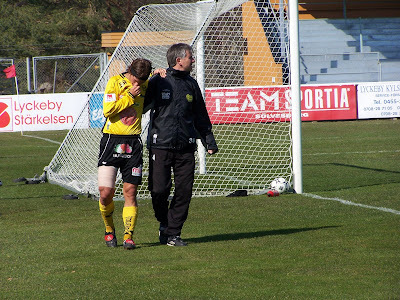 When Wille got hurt it did look very painful, and indeed it was more than just a sprained ankle: poor Wille broke his left fibula. So he will be out for several months until the bone gets back into one piece. Let's hope he can be back some time after summer. TV4 has made a thing on the new MAIF song. 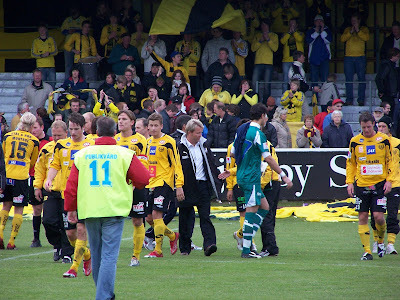 After 2 days Mjällby has the best defense (0 goal taken) and the worst attack (0 goal put). 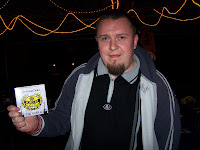 As it has been written by FrenchMink, Marcus Ekenberg and Erton Fejzullahu are not used to play together. The satisfactions are coming from a good performance of Dusan on the 12 corners and from Daniel Ivanovski. 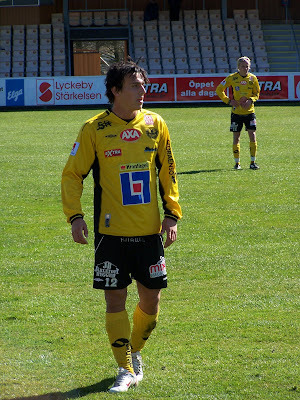 Tobias Johansson came in after the injury of William Leandersson. Daniel Ivanovski MAIF player of the game leaves wih the AXA box. MAIF new sponsor. The FrenchMinks have to change flying compagny. Difficult game for Ekenberg may be not at his top form yet. Adam Berner taken the place of Philip Jonasson. 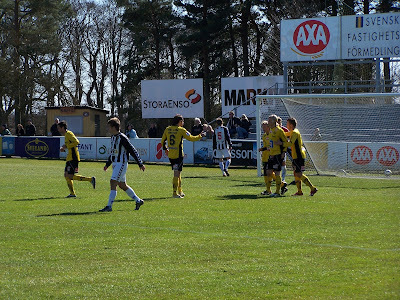 Next home game: Mjällby - Örgryte the 5th of May. 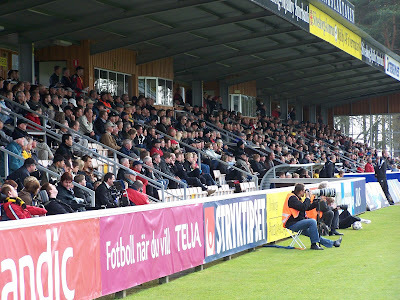 A lot of people (2700) had come to Strandvallen for the first game of the season against IFK Norrköping, which finished a draw 0-0. Mjällby dominated the 1st half, IFK's defense was having a lot of troubles on the sides, but the ball would not get in thanks to a very dense and tightly covered central defense. At the mid-game break, I guess the IFK players got a good yelling at, or good coaching as they call it, because it's not the same team that came back on the pitch. 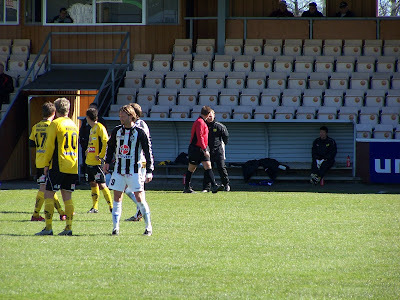 The 2nd half was much more even, but the ball still would not get in for either team, despite occasions on both sides. Both keepers had their hands full and had to be well awake. 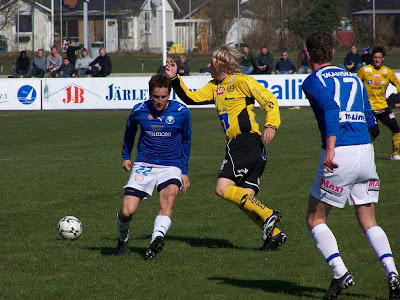 Best MAIF player on the field were in my opinion Daniel Ivanovski and Phille, those 2 were a permanent problem for the IFK midfield and defense on their right side, and Erton with his good technique qualities. Dusan did ok. Wille started well but got injured at his left ankle after only 15 minutes, hope it's not too bad, and was replaced by Tobbe who did ok. Eken as usual, took a lot of beating from the IFK defense which played very physical. The midfield was very even, with good things seen from both teams, and less good things as well. 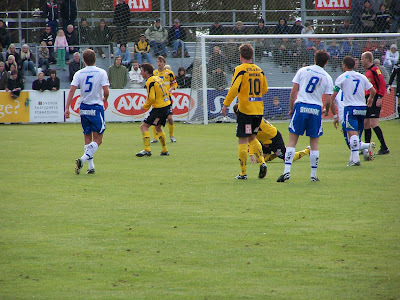 Lindberg very stable, even in the position of goalkeeper (without the hands). Berner got some playing time, but was not decisive, a little disappointment. It was just a pity we did not transform the free-kick at the last second, I would have let Cederberg (who did fine in defense) shoot it. So all in all an even game, and as often in this locked situation no goals. As seen during the training games, MAIF is playing ball a lot more this year. More or less all players are trying to find solutions even when pushed in corners, helping each other a lot. It's lovely to see, and quite much more efficient than just sending the ball away like last year as well. Clear technique improvement on this point. What I like less is the kind of 4-5-1 new organisation, Eken is very alone up there. Erton is not doing a bad job, but in offensive phases he must help Eken more. Also we had 2 good offensive sides, but then there was too little people in the middle to receive the centres. 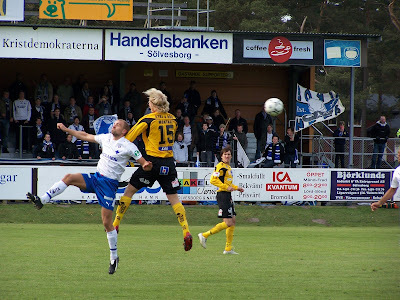 Although admittedly the IFK central defense was very tight. 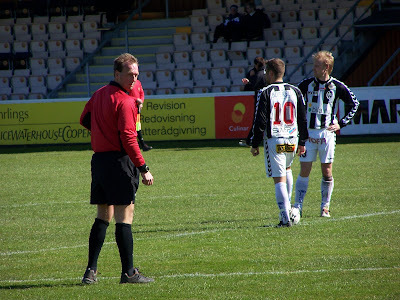 Mr Referee from K-stad was ok for about 1 hour, then he was a little bit a pajas. Not a winner. 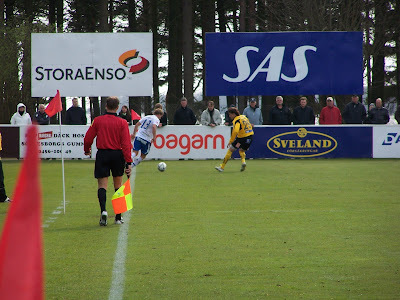 Next game is away against Sirius in Uppsala (the actual Sirius is a bit distant, even with new super-sponsor SAS). 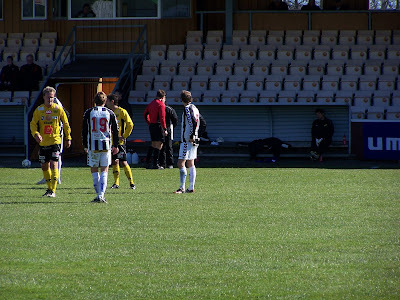 This newcomer team has won their first 2 games against Ljunskile and Åtvidaberg, so they shall not be under-estimated. If we do intend to fight in the top of the table this year, 2 points so far is ok but some teams already have 6, it would be good to start scoring goals, and Uppsala is a good place to start. By the way we are already playing Sirius in Uppsala in the Swedish Cup on wednesday. Radio Sweden will broadcast next game - Mjällby - IFK Norrköping - live on the web. 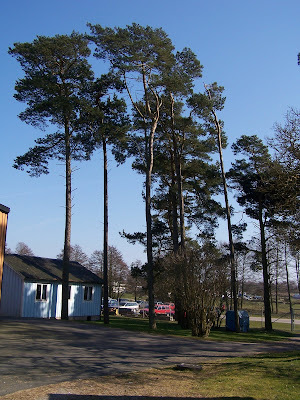 The game of next sunday the 22nd of april starts at 16h and can be found at www.sr.se/blekinge. 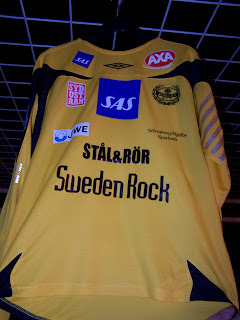 On Wednesday evening Mjällby AIF arranged a sponsormeeting together with new big sponsor Sweden Rock. The most interesting part of the meeting was obviosly when the new MAIF-song was played. For the first time ever Mjällby goes heavy with a hard rock song by Janne Stark and Johannes Lindström from Sweden Rock. The song is called "Göra maul kaa". That would be Lister dialect for "Score Man". 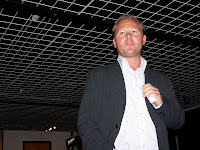 What also happened on the meeting was an update from trainer Thomas Andersson-Borstam after one game played and one point taken. Mikael Ivarsson, president of the Sweden Rock festival, gave us the success story of the festival with many incredible numbers - like that half of all beers served in Sölvesborg is served on the festival - during tree days. The Sweden Rock Festival was also compared to the Mjällby Football team in the sense - things that shouldn´t been possible. 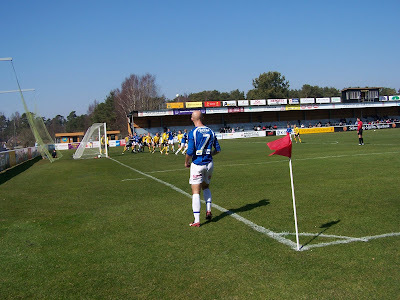 The biggest festival of its kind in little Norje village, and the small team of Mjällby which has spend the last 30 years in the elite football of Sweden. 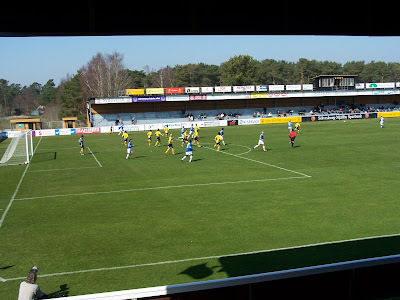 Ivarssons point of view was that Mjällby is playing in the second division of swedish football with the goal to be one of Swedens 20 best teams. 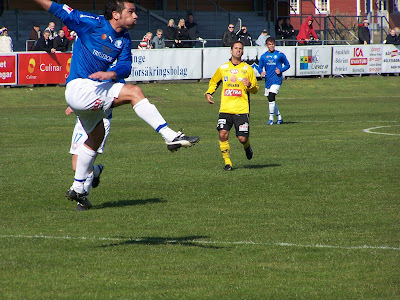 While Sweden Rock already plays in the "rock-Allsvenskan", as the only team. Also Ivar Skogseid from Sölvesborgs kommun and Thomas Jönsson from the sponsor and web creator t&t information presented their company and cooperation with MAIF. 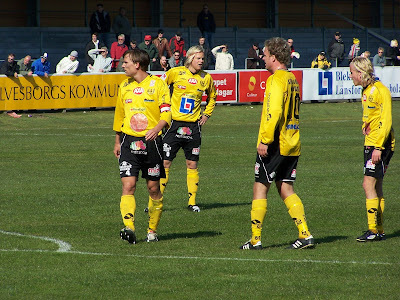 The players where represented by captain Marcus Lindberg, Tobias Johansson and Alexander Malmström. 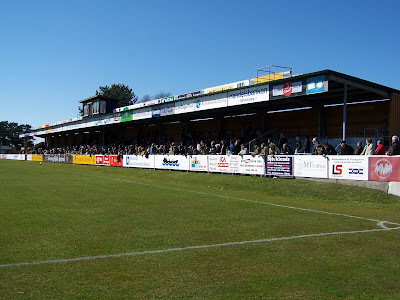 More then 300 people in Strandvallen. 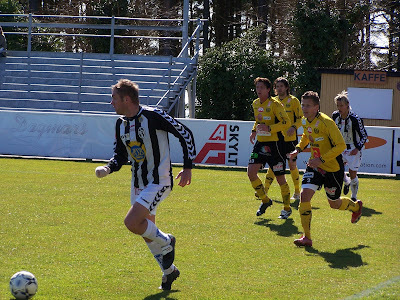 On Friday before Easter Mjällby has played 1-1 at home with Landskrona Bois. 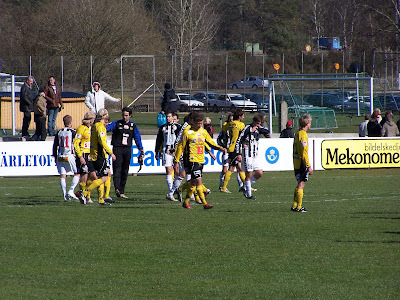 After a good start, Mjällby had to play at 10 due to the red card received by Erton Fejzullahu "the Zlatan of Belkinge". 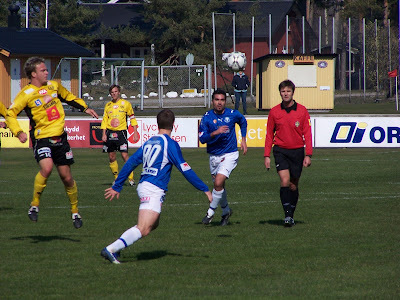 - Philip Jonasson is now a serious candidate to the postion of right or left defender. - Dusan Melicharek was not so inspired. The 0-1 is may be for him. Rikard Fransson had been better last week. - Adam Berner does not have the speed of last year and miss a one to one against the goal keeper. 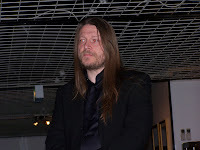 - Alexander Malmstrom did a good entrance. - 6 players came in in second half: Malmstrom, Zimonjic, Osiako, Johansson, Thörnberg and Löfqvist. 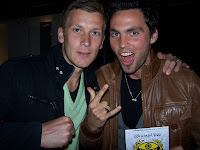 - Johan Svensson was in the public with David Rehn. 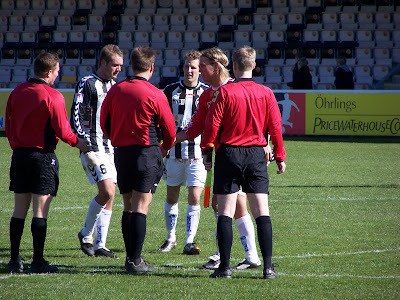 - The referre, the famous Monsieur Håkan Jonasson, gave a red card to Erton who will miss the first game. See the exclusive pictures on the subject ! Yellow and then red card for Erton. 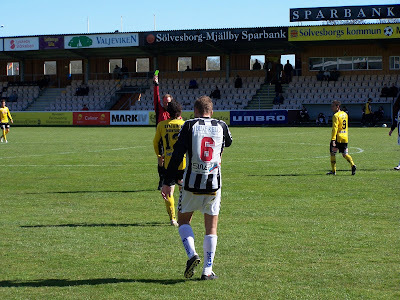 I do not remember the last time Mjällby won against Trelleborg or even took one point... As usual MAIF lost against Trelleborg, 0-1 final score for this friendly game. 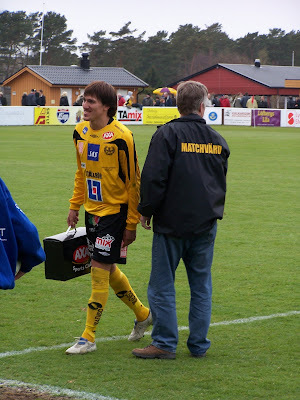 - Wille got injured after 30 minutes and Daniel I. came in. - The game was on the A plan, the grass is fantastic for this start of season. 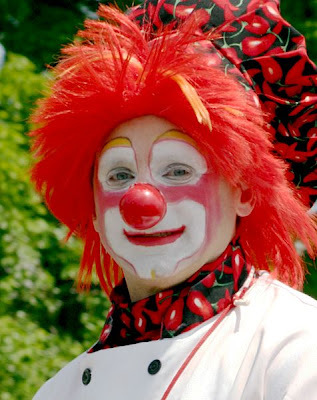 - Marcello has played the last 10 minutes. 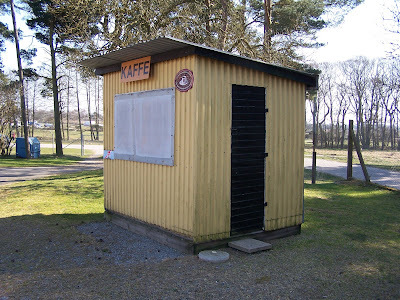 - Fegler was back in Strandvallen. He did a good game. 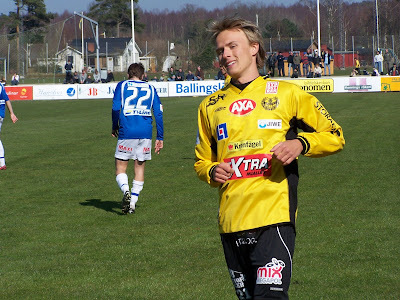 - Rikard F. was good in the goal. Without him, it was 0-4. Soon the season starts and that ´s good. Enjoy the picure. It looks like June.